Your MAP sensor is what the ECU uses to read boost pressure. The stock Manifold Absolute Pressure sensor (MAP) is a 2.5 BAR unit, which tops out around 23-24psi, and looses accuracy around 22-23psi. If you want to accurately see pressures in that range or over, regardless of BT or K04, it's a wise idea to upgrade to at least a 3 BAR sensor. This is important even if you want to run boost pressures around 19-20psi, since the throttle cut and fuel cut settings will be at or beyond the point in the stock sensor range where things get fuzzy, so they may not work consistently, work as expected, or even work at all. In the past this meant trying to find an overpriced sensor,usually in the range of $90-$125, and then having to cut the OEM plug off and solder the wires for the correct plug. There was a premium price since the MAP used by Mazda not only reads boost pressure, but has a built in Temp sensor, which even now, years later, is a nice touch, and fairly unusual in the USA. Frankly, it was both expensive & a PITA, and that kept many people from making a very intelligent upgrade. no soldering, plug n play, completely reversible to stock, and can be re-sold later as a kit if you stock out. The OEM Mazda MAP sensor uses a proprietary connector. This harness will convert that connector into a more standard Bosch connector for use with a wider range of MAP sensors. Corrections to the tune must be made! -> Bring the laptop to your car, fire up ATR and connect it through your AP to the ECU. Through the View menu, set Dashboard so you can view Boost. Dashboard gauges can be set through Options>Gauge List. With the Key On & Engine Off (KOEO) note what it reads for boost. Mine read -0.16. on the stock MAP sensor. You're going to want to end up with your KOEO boost as close to 0 as you can get. 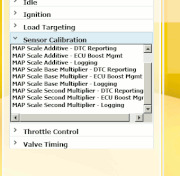 For the 845 MAP sensor, you need to change three sets of MAP Scaler tables, found in the Sensor Cal folder. These are all those other tables in the same place as where you make the MAF Cal changes. Three sets of tables, EM, Log & OBD, make the same changes in all three set, 9 individual tables. Thanks Rob! Working magic like always! The Offset is the one that you need to change to find which value gets you closest to 0. After testing the three most common, I ended up using 6.00. Those three common used reference values are 5.44, 6.50 & 8.35. Below are the values I found. So, start by getting the stock KOEO Boost reading so you have a baseline, then go ahead & swap the map sensor. Next load a map with updated scaler & offset values and check the KOEO Boost. Since it's doubtful you'll be close to 0 with this first revision change just the three offset tables to another of the three baseline values, flash the map, check the KOEO Boost again. Repeat till you determine what offset gets you closest to 0. The offset value needed seems to be slightly different from car to car. It only takes a few moments to make the offset changes & flash the map, so go ahead & try all three common values to get a feel for how they change the KOEO boost reading. You want a offset value that gets you close to 0. The three common used reference offset values again: 5.44, 6.50 & 8.35, and you may well end up using an offset value of your own like I did. I used a offset value of 6.00 to get a KOEO Boost reading of -0.01. All told, it took me ~30-40 minutes from on ramps (to save my back) to off ramps & test drive, including testing the four different versions of offset listed above, to complete this project. Lost hawaiian, AZSPEED3, Kfunk and 17 others like this. Last edited by TiGraySpeed6; 10-31-2014 at 03:39 PM. I need to order one! I can't PM anyone yet =X Please PM me? The MAP Scale Additive corresponds to the Offset value above, MAP Scale Base Multiplier is the Scalar A and the MAP Scale Second Multiplier is the Scalar B. Thanks a lot for this write up, I just came from my tuner's shop on a mission to find an upgrade to the stock MAP sensor, as I'm having issues running boost levels over 21psi, and I didn't want to splice wires or anything like that. You have saved me time and money! relevant now as the day it was drafted. Glad it was of assistance! You're damn right about that! My stock sensor was no good for the hp I'm hitting right now, around 450hp. 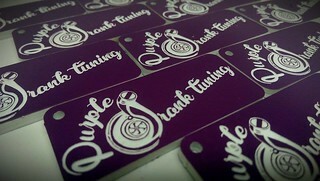 Now I should be able to get it tuned properly and hit 500hp. Thank you. I'm getting a 3.5 BAR soon for the gtx3071. I plain on running around 30psi. as fuel will permit anyway. Tuning this shouldn't be hard at all. Can i use this sensor with the plug n play harness? Does this unit has the temp. Sensor included? I believe so...iirc correctly there are 2 3bar sensors out there...and the 437 will require a different calibration. Will the pigtail fit this one? I will try this soon. I want 25 psi on my precision!!! anyone know if you can use more than 5.44, 6,0, 6.5, and 8.35? Like for example can I set the offset for 6.65? Yes, you can, and you're encouraged to find the value that brings you closest to KOEO 0.00 boost pressure. Thanks again for the write up. Very helpful!! I ended up with a 5.7 offset to get a -0.03. Going to try this. Thanks for the links. MAP swap = EGR delete? I really need to find a place where I can run a bottle if seafoam up the brake line. I don't have the nerve to do it at my house. 2004 Mazdaspeed Miata #3142- Stock, but not for long. 6.6 will read -.06 KOEO. Does the boost psi read accurately? That's the key question, and can be answered by comparing logs from just before and just after your install and configuration of the MAP sensor. As for MAP Voltage- that's not something the AP logs. Are you thinking of MAF Voltage? Do you have a log of this behavior you could post? my AP monitors MAP voltage? Actually, the Gen2 does log MAP Volts. It's not an item I've ever had a need to log, and therefore not part of my default items I have people log. Had to pull up a copy of the gen2 ATR and double check. Unless you've got logs from before where it's reading higher, or your boost is reading off from what you're expecting I wouldn't worry about it. That said, anybody with a gen2 willing to log MAP V and share what you see & what MAP sensor you're using? Does anyone happen to know if the 03085 sensor will work with the Speedperf6manc3 plug and play harness? They don't currently show the 03085 as being compatible. Yes, it does- order it up! So no problem- have at it! So happy I just found this thread. I've been wondering how accurate my boost readings are since I started logging again for the new Corksport BPV and the fact that I'm showing spiking. Been thinking about this upgrade and thanks to OP, it seems really straight forward. Mahalo! Any idea if the following connector is what you need in place of the $65 piece you linked in the original post? Saw it listed with the Bosch 3 bar map sensor on Edge and wasn't sure due to lack of a picture..
'07 Speed6 TiGrey: SURE ID300/Shift Plate+Weight/Breather Hose, Forge BPV v2, CX-7 Antenna, ProSport Boost Gauge, Block8Head's MS6 Pod, Cobb AP v3, ITV22 1SC Plugs, TWM Short Shift, Stage 2 Clutch, JBR Shifter Bushings/Shift Knob/RMM/EGR Delete, Euro LED Tails, AutoTech FP Internals, M2 DP, ETS TMIC, Techna-Fit SS Brake Lines/Clutch Line, Hawk HPS Pads, ATE 200, MD OCC VTA v2, 3-Bar MAP, AWR TMM, CP-E RDM, Whiteline RSB, RB Rear Endlinks, Moog Front Endlinks, Bilstein HD6 Shocks, Corksport Springs. Just curious, but after reading the help file in ATR it shows that the offset used for the Bosch 845 sensor should be -5.41. Obviously it's incorrect, since everyone who's following the steps here are getting good results with positive numbers, so why is it so far off? I know it varies, but the range given by Eric is all positive numbers. Wouldn't have been easy if not for all the lessons you've given me in ATR, thanks again! Hopefully that higher offset is acceptable!